The Tennessee Bill of Sale Forms are documents that prove the legal sale and purchase of various items sold and purchased between business and individuals or private parties. The documents will provide needed information ie: change of ownership, identification regarding items being sold and purchased as well, information with regard to the seller and buyer. Some forms will require notarization. Boat Bill of Sale – This document would be used to prove the legal sale and purchase of a Watercraft in the state of Tennessee. 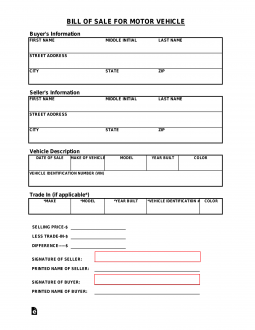 General Bill of Sale – Usually, this form is used between two private parties to prove the sale and purchase of any type of personal property. Firearm Bill of Sale – This document will prove the legal sale and purchase of a firearm. Motor Vehicle Bill of Sale – This form will show the legal sale and purchase of a motor vehicle in the state of TN. This is often needed during the process of titling and/or registration of a motor vehicle in the state.